Speaking at an East Anglian Rail Summit in Westminster earlier this month, Rail Minister Paul Maynard said that large schemes in the regions are key to transport plans, stating that it was really important for the rail industry to consider how it can assist people in thinking about how they can work, and how it can play a role in moving people. For more EXCLUSIVE content from the summit, read RAIL 810, published on September 28. Well mostly level crossings are to be closed and replaced by bridges and underpasses to improve better journey times. 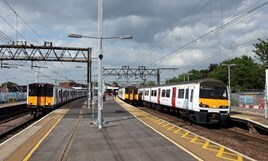 And new overhead wires and overhead structures, beams and equipment have been installed as the old overhead wires that sags and becomes weaker during hot weather have been replaced along the GEML in different sections and areas in East London and in Brentwood area between Shenfield and London Liverpool St and new overhead wires to be installed on the Southend Victoria line (Shenfield-Southend Victoria) with new overhead wires and overhead structures and equipment and also to be installed at Ilford Flyover (between Ilford and Manor Park) and new overhead wires to be installed at Stratford station and between Stratford and Lea Bridge.